You can live life, or you can REALLY LIVE LIFE! In looking at a better way to help my staff sift through the Intel website on project based learning (http://www.intel.com/about/corporateresponsibility/education/k12/projects.htm) I was talking with my assistant and said, “I just want them to find some of the treasures.” The word “treasures” immediately sent my mind racing. Our brainstorming session kicked into high gear and this is what we created! Yo-Ho Fellow Jim Lads! As with all treasure hunts, it always starts with a treasure map! Of course, who has time to make maps, but oh well, I decided this was one of those opportunities to practice what we preach and do it right. 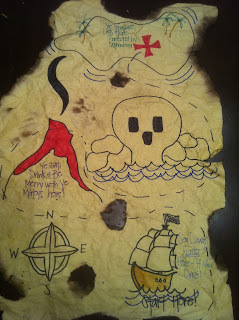 So, we checked out a few sites on making treasure maps and decided to just make them the old-fashion way: draw them! We needed enough for each grade level and the fine arts and special ed teachers, so the magic number was 8. In brainstorming, we had decided that we would have the teachers visit a couple of sites before visiting the Intel site. Initially, we thought we’d put the sites on the map. Of course, as with many things, we got excited and went for the actual cherry on top experience for the teachers! Avast! We found a ridiculously funny video on youtube on how to talk like a pirate (http://youtu.be/fqMu6e5Dgtg). If we’re going to have them go on a treasure hunt, we might as well have them start with something short, fun, and easy. The video is about 6 minutes long and, in the big picture, is meaningless. However, I believe that learning should be fun, so that’s the way we started. Instead of just writing the sites that we wanted them to visit on the map, we decided that they needed to work a little harder and do more thinking on their own. After all, we’re raising students who struggle with problem solving! The webinar was easy to understand and reached a variety of knowledge levels. I also loved that it set a great example of the many uses of online learning. I doubt the teachers listened to every word, but I know they heard “treasures” of what they needed to hear for their own current level of expertise. On the map, I drew a volcano, erupting of course, and a skull with rocks on the sides in the water. The clue to the webinar read, “Ye Eat, Drink and Be Merry With Ye Mateys Here!” Once again, I used a QR code to attach a link to the webinar and taped it to the lounge door. Finally getting to the meat of the professional learning opportunity, I drew an island with a few palm tress and the traditional X marking the spot of the treasure. The map clue read, “Ye Treasure Lies Here, Protected by Wynonna.” Now, I realize that you’re puzzled, but my secretary loves Wynonna Judd, yes, the singer. The key to get into the vault (the school supply/records closet) is on a Wynonna key chain. There are always great things to be found in the vault. The final QR code was taped to the door of the vault. (https://engageteachers.adobeconnect.com/_a816142044/p32153918/?launcher=false&fcsContent=true&pbMode=normal) It was linked to the Intel site that I wanted the teachers to review prior to the staff meeting. There is so much great information regarding project based learning on the Intel site that it would take days or even weeks to wade through it. I really just wanted the teachers to see how much information is available and find some things that they could try in the classroom quickly. Ahoy Me Harties! Are ye are ready to embark on the sauciest of adventures? In ye salty sea dog’s box, a treasure map will be discovered. Ye have until 3 p.m. on Wednesday to find treasures where X marks the spot. Ye will share ye booty with ye jim lads during the staff meeting on Wednesday – or ye walk the plank! I give ye clues for ye journey: ye will need ye smart phones with QR reader downloaded. The first two destinations ye visit alone. The third destination, the most dangerous of all, should be entered as a crew (team). No more than 40 minutes need be spent at the third destination! Ye might find ye self in quicksand as the information is vast. Ye team will present ye booty to ye jim lads in less than 5 minutes – or the plank ye be walkin’. The staff meeting is Wednesday, and I am excited. We will spend about 40 minutes listening to the treasures the group found on their treasure hunt. Meanwhile, at the last staff meeting, I asked the teachers to make sure they have twitter downloaded to their phones. Twitter will be on the screen behind the groups presenting and the teachers will have the opportunity to comment on what they think about the information being presented. Specific links can be posted and we’ll have a hashtag to keep everything together. Later, my assistant and I will be able to look back at the comments and see where we need to go with the concept of project-based learning. Yes, I will probably give out jeans passes to those who make contributions on twitter, or at least to those who really get out of their comfort zone and rise to the occasion. I’m totally fired up – I mean, Arrrgg! Avast ye Scurvy Sea Dogs, I be giddy about me possibilities! Side note: I have a great staff, and I love the “cherry on top” style so we decided to sneak into some of the classrooms during the day on Wednesday and see what kinds of treasures we can abscond from the different rooms. (My daughter said that I should keep a list or I’ll forget! Know it all 12 year old!) We will put the treasures in a large treasure chest, pull them out one at a time and let the staff guess where they originated! It’ll be a fun ice breaker after dismissal and duty! We’ll probably wear our eye patches and bandanas too just to really look the part! Who knows?! It’s all about the cherry on top. I love it!!! Way to make learning fun...even for your staff! Here is a follow up of a classroom two days later that I visited! It was so fun to see the excitement on the students' faces and hear learning taking place. The teacher was really enjoying herself too! It was fantastic! 27 years in education, Pre-K - 12, currently an elementary principal at a wonderful pre-K through 5th grade campus in Highland Village!